Beautiful, OOAK handcrafted by Master Pen Crafter, ChaeyAhne. Handcrafted out of a single, very lovely, naturally molted Rare Breed Turkey Quill. The coloring reminds me of a wild lynx or bobcats coat. It has a woodland birch bark style shaft wrapping, and this pen comes with a gold ferrule which WILL allow for the interchange of writing points (nibs). It will fit any type or style of dip pen nib, and it will come with 3 which includes the one pictured. This listing is for the exact quill in the image. This is an exclusive CSD design, and is of course one-of-a-kind. This pen comes tissue wrapped, and complete with my CSD studio certificate of authenticity. If wishing to order more than 24 pens of - ONE DESIGN - please contact me 1st for my Wholesale Volume Discount Pricing. 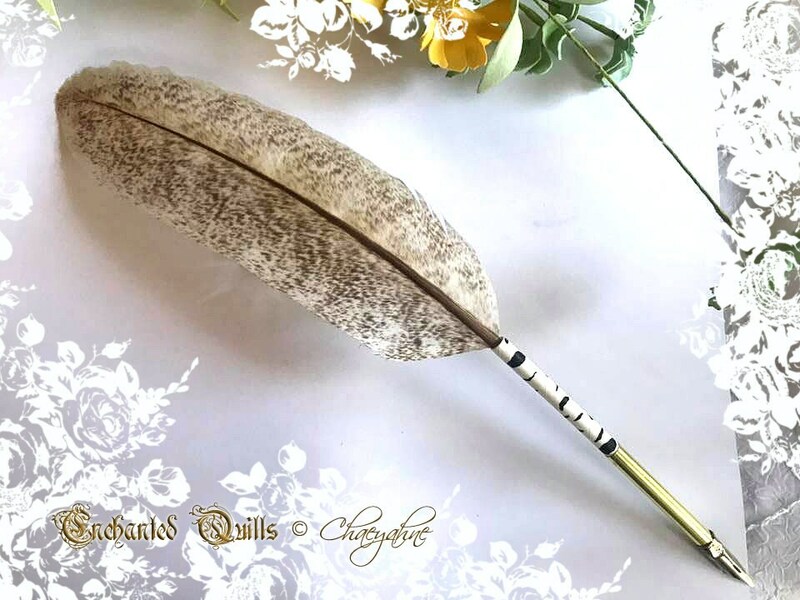 All images, graphics, and content in relation to ChaeyAhne's Artistry & Designwork, INCLUDING wording etc., within the Enchanted Quills Etsy store are ©ChaeyAhne SilverFox Designs, 1983-2018. All rights reserved.